PCB/PCBA – Cost effective, flexible, fast turn-around solutions for all your electronic contract manufacturing requirements. Operating from a modern 115,000 sq. ft factory in the GuangDong area of China, we work together with a network of partners to ensure that all your needs are met, from design and prototyping to fully customizable test facilities and from value focused materials management to final product assembly. Our continuous investment in equipment and people provides broad process capabilities and turnkey solutions to accommodate the manufacturing of complex, small batch, and high volume products. E.E. URD and our partners are dedicated to exceeding our customer expectation through quality and flexibility, supporting customers in their goal to optimize responsiveness to a dynamic market. 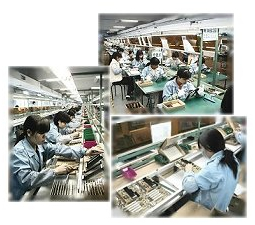 We specialize in providing the best contract manufacturing service for International OEM's. We are proud to offer a broad range of Electrical and Mechanical engineering services, assisting customers at any point in the design cycle from concept, through production and packaging. Product strengths include computer peripherals, telecommunications, industrial electronics, and consumer electronics. Accredited to ISO9001:2000 and have a policy of continuous improvement within the workplace. Design unique and individual systems, carefully tailored to suit specific customer requirements. Flexibility, responsiveness to dynamic markets, shorter manufacturing lead-times and a commitment to total quality and customer satisfaction. We also design and manufacture test jigs for your in house specific, stand alone, or PC based functional testing of the finished product. We understand the importance of test, at both PCB and finished product levels. Our design center specializes in low cost, fast turnaround solutions for our customer's requirements. We can undertake any part of the electronic design from complete product design, from concept to production, or from circuit diagram to PCB CAD design. Our engineering team knows how to minimize susceptibility and radiation, developing products which meet both manufacturability and testability requirements. Our team is continuously updating and expanding their skills and tools to meet the need of our esteemed clientele. We provide a total solution to material management unique to your individual project requirements. This includes a comprehensive sourcing and procurement service, free issue and purchased material control, and advanced material handling. Increasingly, technology is necessitating OEM's to initiate more frequent design changes and reduce product life cycles. The materials department of experienced procurement and logistic professionals ensures that these demands are fully supported through methods such as design for procurement, thus enabling customers to concentrate on their core competencies. The purchasing function is structured to focus on both the customers and their projects whilst maintaining market awareness of the commodities sourced and exploiting volume procurement opportunities through cost down activities. This approach encourages the further development of supplier partnerships and it is through this philosophy that lead times are reduced and materials are delivered at the right time, the right quality, and at the right price. Our mission is to maintain the competitive superiority of our clients and ourselves in the market place. We continually strive to improve our product quality and efficiency while simultaneously driving to exceed every customer's expectations of quality, yield, and cost. Materials and products conform to contract requirements and the expectations of our customers; we are committed to the principles of ISO9001:2000. These objectives are achieved through the implementation of its quality system procedures in the form of documents issued, controlled and authorized by management. Quality manual issued to the appropriate personnel, inspection reports available on a day-to-day basis, records made available to our clients as evidence of product quality conformance. Superior quality program training for all employees, updated regularly. Quality standards will be sensitive as per our engineers suggestion, thus quality standards will adjust per our customer's requirements. Employees learn, understand, and practice quality conformance as an integral part of their job function. For normal quality inspection, the QA sampling plan is strictly following ANSI/ASQC Z1.4 regular II, which equivalent to BS-6001-1 and ISO2859, sampling plan level II. While AQL is base on 0.65, c=0 standard. For PCB assemblies, workmanship standard is following IPC610C, Class 2.